HB Arcade Cards has one thing working for it, and three things working against it. Let’s start with the good news: it’s six great games for one low price, but you don’t need to read a review to tell you that. So now on with the bad news. The first problem the game has is that there is no multiplayer function. Of course, the lack of online is common in Wiiware games and the lack of local multiplayer is understandable in this case given that it would be impossible to keep your hand of cards hidden from other players. But the lack of any multiplayer of any kind is just bizarre given the social nature of the traditional card games included. As a result, the game works as little more than a practice mode to build your skills against a computer player. The second problem with HB Arcade Cards is that, although it does feature a tutorial, there are no other features or optional rules to keep the games interesting. Although the game advertises Mii support, this is nothing more than a portrait that displays your face in game and has no other effect on game play and so barely qualifies as a ‘feature’. 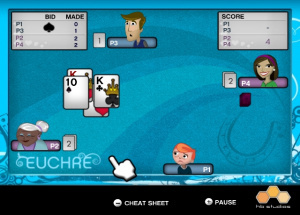 Does your group of friends like to play Rummy without the Aces are high or low rule? Too bad, because there is no way to swap out that rule, or to add any of the hundreds of other optional rules the game has grown over the years. You just get one rule set for each card game and you have to learn to like it. Between the tutorial and the rulebook, the game gives you just barely enough information to learn the rules. Although you will no doubt be forced to search elsewhere for help if you are new to one of the games as the operations manual is the shortest we’ve seen and the tutorial glosses over a lot, giving no hint of strategy or how to actually get good at the game. The third problem we had with HB Arcade Cards was the clunky interface and fuzzy text. As expected, the game allows you to pick up cards with the Wii remote pointer like you would a mouse. However, the playing field is not an open table where you can move cards around freely. Instead, there is a pre-set location where cards must be placed in order to work properly. As a consequence, in some cases you will have to view the tutorial just to learn the interface even if you are already familiar with the game itself. 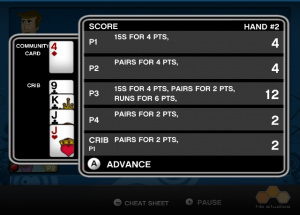 Moreover, the text is small and fuzzy resulting in difficult to read tutorials as well as confusion between spades and clubs. Lastly, we came across confusing scoring in Rummy where the game kept a running tally of points scored, but did not subtract for points lost for cards in hand. As a result, the player was shown a score total in game for all players that did not match the actual ‘score’ which is shown only between rounds. This lack of showing a score during a round of play held true in other games like Hearts. If you want to strategically give the Queen of Spades to the player who has the lowest score, you’d better be paying attention to the score in between rounds because there is no way to see the score in the middle of play. We said there were three problems with HB Arcade Cards but let’s face it, there’s a fourth glaring issue. And, as it’s more of a marketing problem, it’s one we don’t usually discuss in reviews. HB Arcade Cards is a collection of public domain card games some of which you no doubt received for free with your computer and you can certainly play for free (multiplayer!) elsewhere as well. And sadly, these free games tend to look better and feature more optional rules as well. Most likely, if you are reading this then you are just two clicks away from one of these superior games right now. But these games exist primarily as things to do when you should be working. 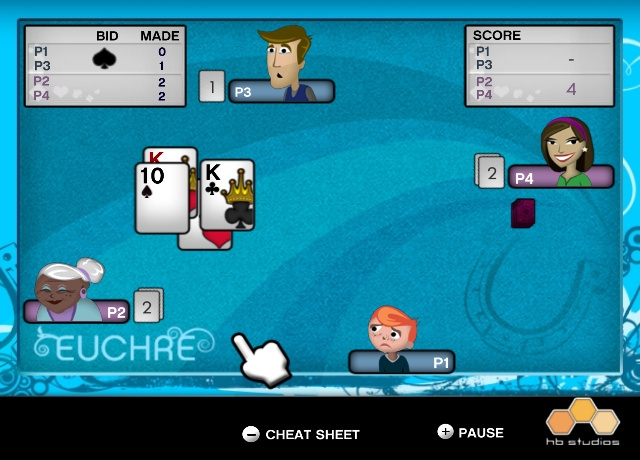 The next time you play a game such as Hearts or Euchre it should be on your computer, in a window you can quickly minimize. If, instead, you choose to bring a Wii in to your work office and you get caught because there is no window for you to minimize that game of solitaire you are playing on a 32” plasma screen hanging from a thumbtack on your cubicle wall then we think you deserve to be fired. HB Arcade cards is a collection of free games for 500 wii points. That about sums it up. The presentation is as basic as you can get with no options and no ability to play anyone besides the computer. Although the computer is a competent foe, these games are generally prized for their social aspect and get old quickly when played alone. While the games themselves are timeless fun, the manner in which they're presented here is disappointing and the average gamer certainly deserves better. 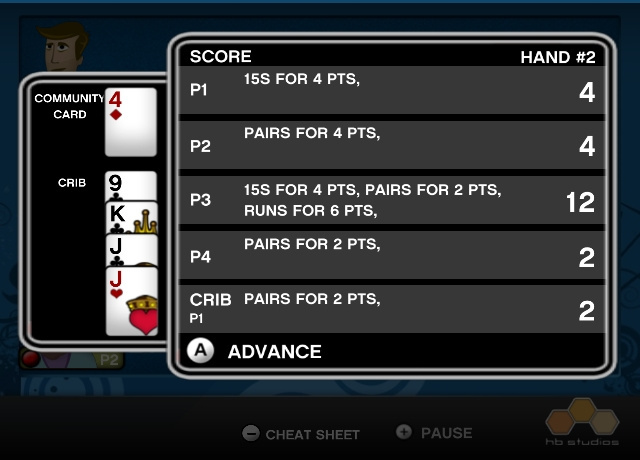 What is Cribbage and Euchre? Never heard of them and it would have been nice if the review could at least have summed them up in a single sentence. I am happy with Clubhouse games, no need for this game. This game doesn't look that good from the start. no room for house rules is usually my problem with computerized card games. I had hoped the game would turn out okay but once I heard there was no multiplayer before it came out that sealed the deal for it I'm afraid. Excellent review. Computerised card games never struck me as terribly clever outside of Klondike (why has no one put out Canfield?) 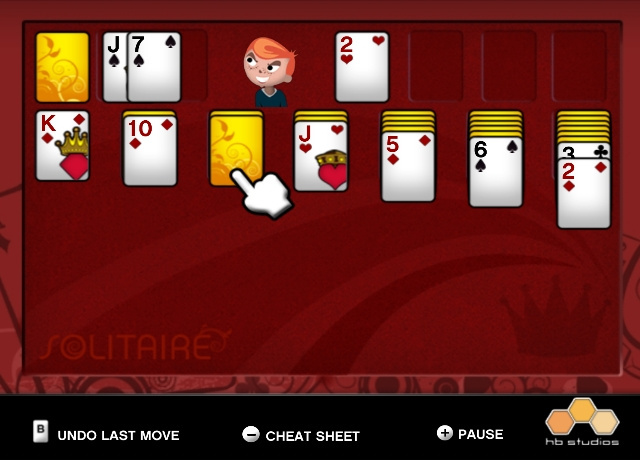 or Freecell -- of course I have freeware versions of both on my Mac! Really pointless this; good on ya for reviewing it Spencer! I just don't think it's possible to sum them up in a sentence apiece. Although I normally explain games in reviews, here it would have greatly bloated the review to take the time to actually explain all six of these games when really all anyone wants to know is whether or not this is a good venue to play them. speaking of card games being not clever just look at the title of this game. It just screams generic. I almost forgot there is one option in one of the games. 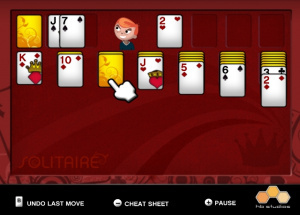 In Solitaire you can choose between draw one or draw three. Sorry. this game looked horrible from the start and im not surprised by the score. S'ok guys, I took care of it.